Ever wondered why there are so many health food advocates out there who make it known to everyone what they are eating and why it's so much better than what you have in your lunch box right now? We now live in a world of seemingly crazed health food advocates and consumer nit-pickers. You may even have gotten used to terms like 'granola' and 'hippie', or adjectives like 'Whole Foods conservatives' which describe friends of yours who are the type to post Instagrams of their lunch all over their social media sites. They may even be so extreme as to wear shirts that say "This chick was raised cage-free", and listen to songs like "Nothing But Flowers" by Guster and live every word. Well, okay I admit it, brothers if you're reading you're rolling over laughing because I'm guilty of a lot of the above... I don't yet have a shirt that says that but hey, my birthday is coming up, maybe one of my lovely followers will ge... Scratch that, please no one get me that shirt, the other chicks in the world will be jealous. Anyways, aside from seemingly perpetual drama that we crusaders for real food tend to create, willingly or otherwise, our voices are not speaking out for nothing. If you've ever wondered why we need to keep letting everyone and their mother (one of my actual mother's favorite sayings) know that we disapprove of the junk, it's because of the many loopholes in our food system, in our government, that continuously favor the power and intentions of big companies over the health of our population. It's because we can't count on the FDA to protect us in the way where we can blindly pick up a product and know that because it's in a grocery store in a neat package that it is safe. Countless major companies, in their pursuit of gaining the most profit, use the cheapest quality ingredients, and add chemicals, additives, preservatives, artificial coloring, etc so that their product will last longer on the shelf, appear attractive to small children. Just because a packgage of Kraft Mac n' Cheese includes an adorable picture of SpongeBob, who your little guy happens to love, unfortunately does not mean that Kraft cares about your child's health at all. Or at least, not nearly enough to make sure that the ingredients they use are safe. In fact, the only time they look into that is when Europe tells them they will ban their products from their stores until they change. Yet, we in America continue to get jipped in exchange for their profits. 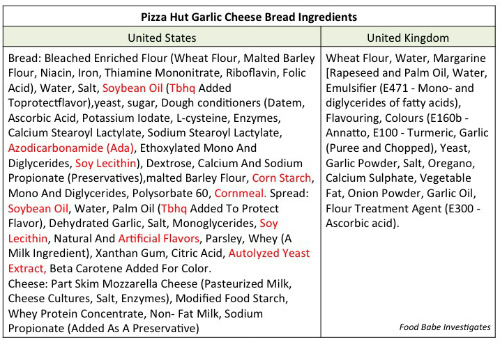 In Europe, for example, they have banned additives like Azodicarbonamide (you know, the stuff they make yoga mats out of that was recently discovered to be used in Subway sandwiches), Europe has a ban on GMO food period, and as a result Kraft Foods, Betty Crocker, McDonalds, Pizza Hut, for example, have changed their ingredients to be healthier in Europe, because some money is better than none at all. 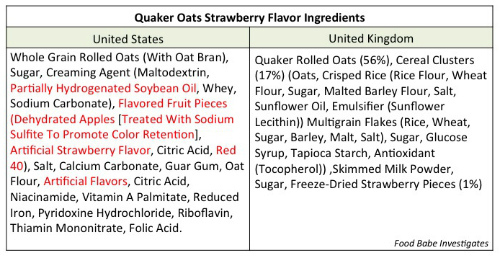 Before you read about the process of adding these ingredients, check out these shocking side-by-sides from FoodBabe.com, where she shows the different ingredients that are currently used in the U.S. vs the UK. The only reason things are changing is because we are using our voices, doing the research, and speaking out about what we actually want and deserve. We speak out for the people who don't know. So, I beg of you, please read this absolutely fantastic infographic, learn about how messed up the system is currently, and only buy foods when you can pronounce every ingredient on the label. For now, cheers to healthy, pure, organic, real, delicious, flavorful, perishable, natural, food. And to the fact that now, because you know what not to trust, you can choose the right foods without the health risks. You have the power to change by making the first step. You vote everytime you purchase a product. Supply and Demand is how this country works. Hot off the... Web..Raw Brownie Bites Nutrishus Webisode! It's been a lonnnng time since I've last posted, but our producer Marisa just let me know that she's finished editing this episode of Nutrishus, hosted with special guest star, Max. So without further ado, I present you with our episode! Watch and learn how you can make these delish healthy alternatives! Dark Chocolate Banana Pancake Frittata! Good Monday morning, friends! I thought I'd share with you my newest favorite recipe creation, which has quickly become my favorite guilt-free morning treat. The pancakes are gluten free, dairy-free, refined-sugar free, and you would never be able to tell. Plus, they are packed with protein and fiber and will melt anyone with a sweet tooth's mouth. While creating them, I noticed it is quite difficult to keep them in their pancake form as a result of their density and lack of gluten of course, so it is best to keep them small if you are going for the pancake shape-- they will work, but you have to be patient. If, however, you aren't always patient like me, you can change things up and wow the crowd by plopping that frying pan in the oven and creating a fluffy pancake 'frittata'. The only difference there is the way you cook them. Either way, keep your oven at 345 degrees F to start out, and decide later; it will be beneficial because you can use your oven as a warmer if you decide to go the traditional route! In a mixing bowl, combine wet ingredients, whisk together. Mix together dry ingredients. Fold wet ingredients into dry ingredients. Add 1 tbs coconut oil to frying pan. If you are going the traditional pancake route, drop about 1/4 cup of your pancake mixture into the pan. Wait about 4 minutes, or until the edges start to form and brown, flip. If you want to switch it up, and go for a fluffier concoction, add your tablespoon of coconut oil to your frying pan, pour in the batter (pan should now be about 3/4 full). Let it cook and firm up for about 8 minutes. Use your judgement to determine if you'll need more time. The edges should start to form enough that if it were a traditional pancake you would be okay to flip it. Once it has gotten to the point where the edges are firm, place the entire pan in the oven at 345 degrees F, for about 10 minutes, or until you can stick a fork in it and it comes out clean! Notice how you can easily slice a piece and it comes out fluffy! Feel free to add more diced bananas and decorate with cocoa powder. If you're feeling in the mood for even more sweetness, add some organic 100% pure maple syrup on top! Enjoy! (c) Patricia Doheny 2014. All rights reserved. Ow. Ow. Ow. I couldn't help myself and had three macarons this morning (totally silly because they have so many ingredients that they aren't ideal for allergy testing) after my usual green juice and lemon water....and my stomach hurts! For the rest of the day I'm going to take a break from sugar and things like this and reintroduce cheese (allergy-testing friendly) because it is one ingredient and easily testable. I want to see if it was the dairy in the macarons that set me off. I am betting however, that it was the refined sugar, because I also feel a little queazy and tired now. Enjoy our episode showcasing the best pizza on campus (and in my opinion, in all of CT!) They use local, fresh ingredients and are incredibly allergy/sensitivity friendly. Offering the best gluten free pizza I have ever tried. Have to share this after my experience this morning! Thanks to Katie Rosenberg the amazing graphic designer of the Conscious Cleanse!